It's pasta week on FBC! Granted, this is a self-declared pasta week but we wanted to celebrate pasta recipes from all over Canada. We've tried out wide noodle pasta dishes, skinny noodle recipes, gnocchi and today, we're checking out shapely noodles - ooo la la! Well, they're not quite that risqué but, these are all those fun noodles like elbow pasta, fusilli (we can't think of Fusilli without think of Seinfeld! ), rigatoni, penne and more! Be sure to visit every day this week as we share even more delicious pasta dishes - tomorrow we'll have stuffed pasta and casseroles - pure comfort food! 8 Pasta Recipes with Shapely Noodles - ooo la la! 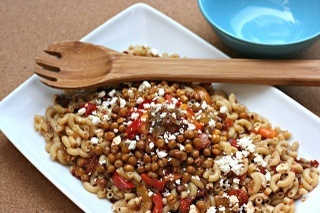 [Caramelized, Oven Roasted Mediterranean Pasta Salad with Chickpea Croutons](http://hellocreativefamily.com/caramelized-and-oven-roasted-mediterranean-pasta-salad-recipe-with-chickpea-croutons-recipe/) from Crystal at **Hello Creative Family**. [Speck and Radicchio Fusilli](http://www.thesaltyalmond.net/recipes/speck-radicchio-fusilli) from Athena at **the Salty Almond**. [Pasta with Prosciutto, Peas and Mint Leaves](http://noshingwiththenolands.com/pasta-proscuitto-peas-mint-lemon/) from Tara at Noshing with the Nolands. [Puttanesca](http://thekitchensinkblog.com/tagged/fbcpasta) from Sara at **Everything But the Kitchen Sink**. [Grilled Asparagus and Nectarine Pasta Salad](http://fromthelandweliveon.com/grilled-asparagus-nectarine-pasta-salad/) from Sofia at **From the Land We Live On**. [Quick and easy spicy pasta with pomegranate seeds](http://www.torviewtoronto.com/2011/01/pasta-quick-and-easy.html) from Akheela at **Torview**.